Product prices and availability are accurate as of 2019-04-25 13:58:45 UTC and are subject to change. Any price and availability information displayed on http://www.amazon.com/ at the time of purchase will apply to the purchase of this product. Travel the galaxy with Han Solo, Chewbacca and others in the iconic Millennium Falcon! Aim for the stars with the Millennium Falcon featuring streamlined design, detachable cockpit, spring-loaded shooter, holochess board and lots more. One of the most iconic starships of the Star Wars saga is back, and it's leaner and meaner than ever before! 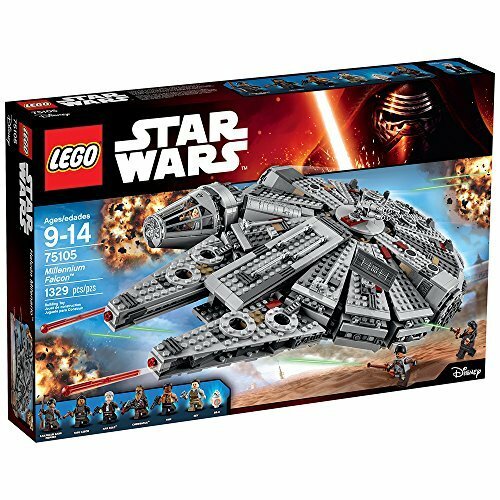 As featured in exciting scenes from Star Wars: The Force Awakens, this latest LEGO version of the Millennium Falcon is crammed with new and updated external features, including an even more streamlined and detailed design, detachable cockpit with space for 2 minifigures, rotating top and bottom laser turrets with hatch and space for a minifigure, dual spring-loaded shooters, sensor dish, ramp and an entrance hatch. 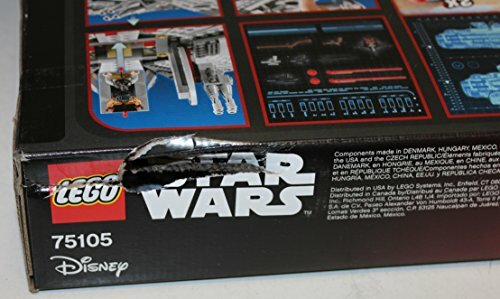 Open up the hull plates to reveal even more great new and updated details inside, including the main hold with seating area and holochess board, more detailed hyperdrive, secret compartment, extra boxes and cables, and storage for spring-loaded shooter ammo. 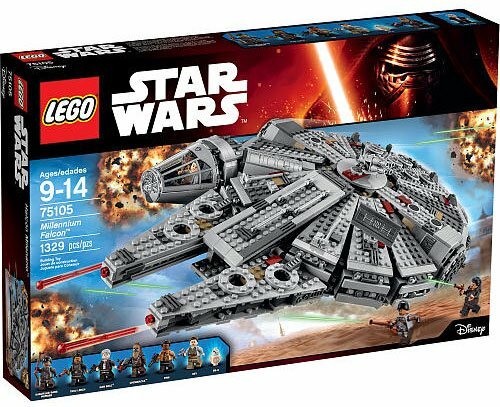 And of course no LEGO Millennium Falcon Star Wars toy would be complete without Han Solo and Chewbacca, as well as other great characters from Star Wars: The Force Awakens. Activate the hyperdrive and set course for LEGO Star Wars fun! 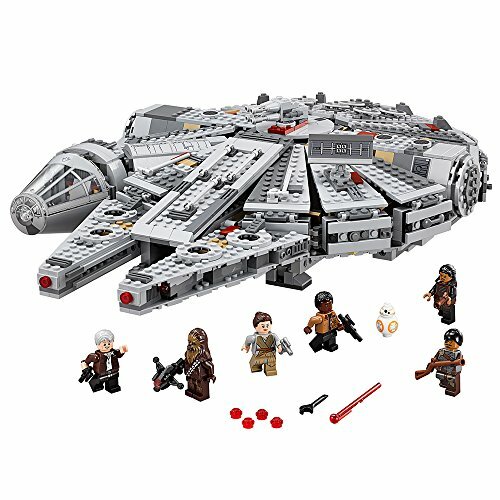 Includes 6 minifigures with assorted weapons: Rey, Finn, Han Solo, Chewbacca, Tasu Leech and a Kanjiklub Gang Member, plus a BB-8 Astromech Droid. Exterior features streamlined and detailed design, detachable cockpit with space for 2 minifigures, rotating top and bottom laser turrets with hatch and space for a minifigure, dual spring-loaded shooters, sensor dish, ramp, entrance hatch and opening hull plates. Detailed interior includes a more detailed hyperdrive, holochess board, secret compartment, extra boxes and cables, and storage for spring-loaded shooter ammo. Weapons include pistols, blaster, gang pistol, gang rifle and a bowcaster. Lift the hull plates to check out detail. Detach the cockpit. Fire the dual spring-loaded shooters.